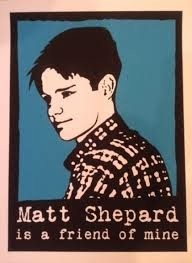 The title of this documentary is truth in advertising - it interviews mostly friends and family of slain college student Matthew Shepard, notoriously beaten to death in Laramie, Wyoming, in 1998 in what was judged a homophobic hate crime. Their words build a composite portrait of the low-key kid whose name became a touchstone for gay activists, and director Michele Josue personally knew Shepard growing up. We hear details and see home movies, videos and photo albums of the personable Shepard growing up with two supportive parents, being interested in school theater and so slight in build and manner that one of his more out-and-proud friends called him a "pocket gay." He was not an especially extroverted type, but did not seem to have an enemy in the world, at least according to this film. But, horribly, that was not the case in October, 1998, when, as a 21-year-old University of Wyoming student in Laramie, Shepard was ambushed by a pair of downwardly mobile roughnecks who robbed him and left him for dead, tied to barb-wire fence. In keeping with the title and mission statement of the movie, the audience gets the vantage of the crime, the murder-trial aftermath, the nationwide media coverage and subsequent rallies and memorials from the vantage of Josue, and from Matthew’s other friends, and from his parents. There are law-enforcement and medical personnel testifying to the hideous deed, but no guest speakers from GLAAD, no grandstanding politicians or Camille Paglia (you must forgive me, there was time there about a dozen years ago when Camille Paglia showed up to render an opinion in just about every documentary except maybe MARCH OF THE PENGUINS; I’m still sensitive). This approach leaves out one not-inconsiderable facet of the story, the creation of the stage-and-film production THE LARAMIE PROJECT, which has and likely will keep Matthew Shepard’s name alive for a long time to come. That’s okay; the showbiz scenery chewers are not missed. Nor is there mention of a recent allegation that Shepard’s murder was not actually a hate crime but the result of a drug deal gone bad, with the two killers mistakenly thinking that if they used homophobia as their alibi they’d get off with a light sentence. Much as that throws the outrage into a whole different light, it does fall eerily in line with the mindsets of convicted, homicidal gay-bashers in documentarian Arthur Dong’s 1997 LICENSED TO KILL and is perhaps worthy of comment and inclusion, even if specious and agonizingly defamatory.